King Tool is multi tasking tool for Samsung android devices. It is used to repair and unlock Samsung smartphones and tablets. It support for many phones. 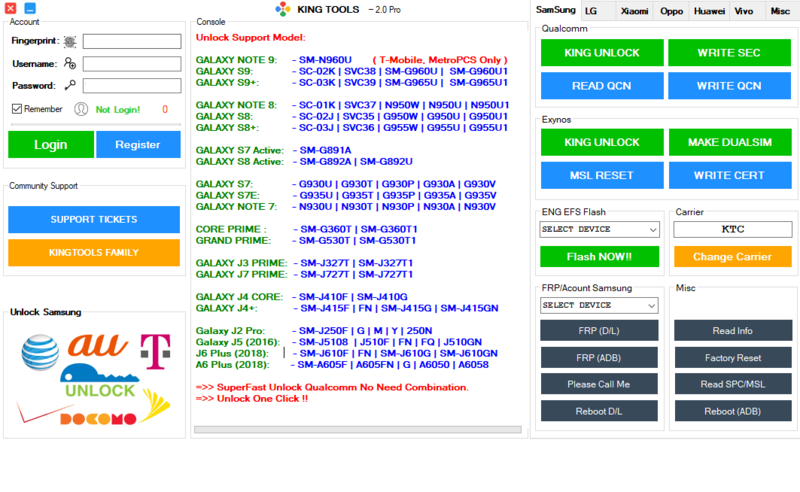 The Best and Cheapest Tool Remote Unlock Samsung USA and Japan Phone: T-Mobile, MetroPCS, Sprint, AT&T, AU KDDI, Docomo. Download King Tools Latest Setup from the official link and install it on your computer to unlock your device easily. King Tools latest version comes with lot of new and powerful features. Below is the list of some amazing features of King Tools latest version.